When it comes to getting the best out of meal planning, it’s usually a mindset matter rather than a lack of pots and pans and recipes, or even time, that really holds us back. Today, I’m sharing some myths about meal planning that may be sabotaging your efforts to kickstart your meal planning journey. No they don’t. It’s as simple as that. The basic idea of meal planning is just dedicating some time to thinking about which meals you’ll eat over a given time and what you need to do in advance to ensure you have the meal ready to eat at your chosen meal time. There’s no need to bend yourself into a pretzel and make every meal at home. Depending on what foods you like, take out meals and eating at a café or restaurant are totally acceptable meals to consider in your meal plan. With home delivery services like justeat, ubereats and deliveroo, you may even be able to have meals delivered from your favourite restaurants. You could even consider using the services of hellofresh where food packages filled with ingredients are delivered to your door and then all you have to do is cook them. Meal planning doesn’t mean you have to actually make a meal from scratch. Not at all. You can mix it up in whichever way works for you. You’ve probably seen those very photogenic flat-lays of containers filled to the brim with neatly chopped bright-coloured veg, usually featuring on an instagram account. The message coming through, is that the meal prep was done in one session. However, that doesn’t need to be the case. Of course, it’s handy to make a whole batch of chicken or rice for a few days, but that isn’t a cooking law to be obeyed. Feel free to do a little prep the day or night before. Personally, I think it’s a far easier and more successful way of keeping up with meal planning. One evening, your prep might be ‘take the frozen lasagna from the freezer’ and pop it into the fridge to defrost overnight. Another day, it may be ‘fill up the slow cooker and switch it on before leaving the house in the morning’ (I haven’t got my head around slow cookers yet…one day, perhaps). So when it comes to meal prep, there may be steps to do all in one long session at the weekend, but it can also be easily broken into smaller steps and scattered throughout the week too. Breakfast, lunch and dinner multiplied by seven days equals a lot of meals to plan for. However, there’s no need to have a different dish for every meal. I’ve written an earlier blog post all about using meal themes to plan your dinners, this can also be used to plan your lunches and other meals too. There’s no need to have a different meal each meal time. There’s nothing wrong in creating a fixed weekly meal plan that you use every week for a month and then change things up. There are lots of creative ways to use a meal plan that won’t have you making a thousand different dishes. In my view, meal plans are mainly for dinner, but that’s just my opinion. My lunch breaks are short and I use them for much more than eating, so a packed lunch that is small, portable and can be eaten quickly works for me. There’s no reason why you can’t do the same. Go ahead and plan dinners or plan every meal including snacks. Another approach would be to plan weekday meals and leave the weekends free for other options; meals out, dinner parties, leftovers and freezer food. It’s easy to think that meal planning lends itself to eating paleo or low carb or something else. The truth is it does, but it doesn’t mean that you have to follow any particular nutritional plan or diet. Meal planning at its simplest is thinking about and preparing your meals ahead of time. So of course, you can plan to eat junk and processed food, but why do that? If you’re prepared to put in some effort in advance, then why not make eating a nutritional feast. There’s no reason why you can’t mix and match a variety of diets as a way of testing them out for the long term. Either way, there’s no need to use a scripted meal plan from a popular eating style. You get to choose what you eat and in this case you can have your meal plan and eat it too . Not really, a meal plan is what you decide it is. So if you want to make the same meal every night for a week, then go ahead. If you’re feeling a little limited in ideas and would really like to have a lot more recipes under your belt, then read my post on how to create a long list of recipes. 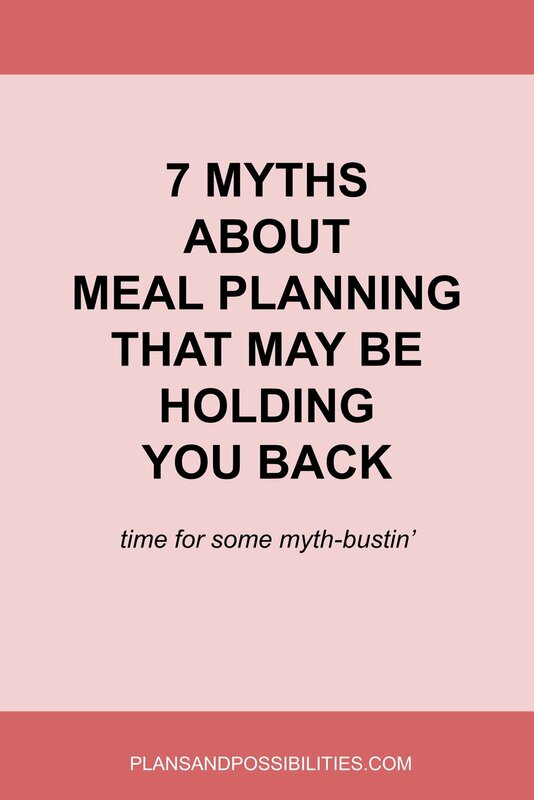 This myth largely stems from the idea that meal prep is a weekly event and takes hours of your precious weekend time. Not so. There’s no need to have a long meal prep session on any day of the week, of course you can batch cook an ingredient that you’ll use as the base for most of the week’s meals, but you don’t need to make every meal ahead of time. You can easily do a little bit of meal prep for each day and you can leave the final steps of cooking until the day the meal will be eaten. So we’ve achieved some myth-busting today. Now it’s time to get on with meal planning. If there are any other thoughts that are stopping you from getting started, let me know in the comments below.